The biggest benefit of drawing is that drawing changes how you see. Drawing is a form of active meditation, a mindfulness practice, and a wonderful stress-reliever. That all sounds great. But what if you can’t draw? I have good news: the worse your drawing skills are, the easier today’s “drawing” activities will be for you! Back when I was a mathematics professor, I had the habit of trying new things that were completely foreign to me. I wanted to stay in touch with the feelings of awkwardness, embarrassment and disorientation of starting out in a new learning endeavor, so I’d have empathy and compassion for my students when they felt fearful and uncertain. I was casting about for the next new thing, and one of my students—a triple major in math, theater and studio art—suggested I learn to draw. It was perfect, because after I passed out of the crayon stage of school, I did almost no drawing beyond the sketches I was required to make in my biology notebooks. Sketches that were indecipherable to anyone, including me. So, I started working my way through Betty Edward’s classic, Drawing on the Right Side of the Brain. But the book that really turned my world inside out and set me on the path to discovering the artist within was The Zen of Seeing. Drawing as Meditation by Frederick Franck. I had been meditating for many years, but I don’t think I truly understood mindfulness meditation until I started doing blind contour drawing, as described by Franck in his captivating book. 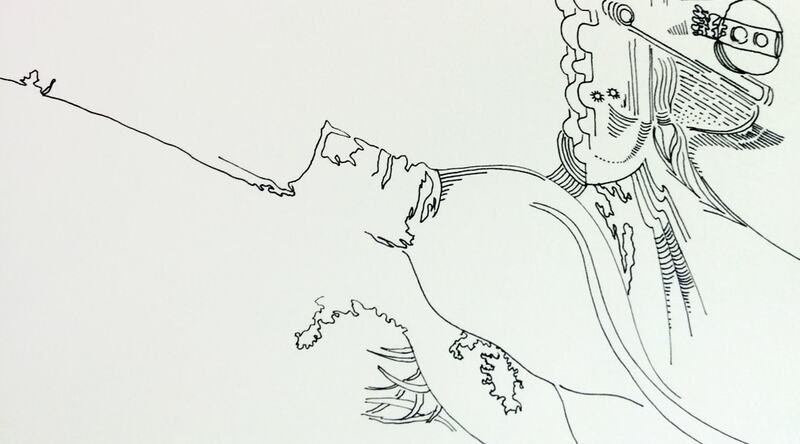 What is Blind Contour Drawing and Why Should I Try It? Blind contour drawing is worth practicing because it is the purest use of drawing for seeing the world deeply and fully. You will be amazed at how little you have really seen of things that you’ve encountered every day for your entire life. It’s also a great meditation practice for people who want the benefits of meditation but feel they are no good at it because they can’t seem to quiet their thoughts. Having a “task” to do can help you sneak past the internal monitor who objects to you “sitting there doing nothing”. Contours, in drawing, are just perceived edges. I say “perceived” because the contours we are talking about here are not just the edges of “things”, but also the “edges” we see inside and across things such as the edges of a reflection in a glass, the edge of a shadow that falls across a scene, the “edges” formed by the individual hairs of your cat’s fur, the edges formed by folds in fabric, and so on. Blind contour drawing is just drawing contours without looking at what you are drawing. The best way to understand blind contour drawing is to give it a try. But, if you already know how, or if you start to feel stressed just reading about it, skip right on down to the section on Wonky Wobblies! You’ll need a pencil (or pen), a piece of paper (or journal page) and perhaps something to support the paper, like a magazine or clipboard. Choose an object or scene that interests you. Natural objects are often better, because they have so many interesting contours. A leaf, a houseplant or your sleeping dog’s paw, a shell, a patch of grass or some bark, for example. Focus your attention on a spot on one of the object’s contours about the size of your pencil point. Slowly and lovingly allow your eye to travel along the contour of the object. If your contour touches or crosses another contour and your eye wants to follow that one, allow it to happen. As you eye travels along the contours, allow your pencil to travel along the page, trying to keep your eye and pencil moving at the same rate and direction. I like to think of my pencil is acting like a device recording where my eye wanders rather than a “drawing tool”. Don’t lift your pencil and don’t look at your “drawing”. (That’s the blind part.) If you run off the page, simply put your pencil back in the middle and start again. You don’t have to try to “find your place”. The point is to use your pencil to help focus and slow down your attention, not to “make a drawing”. A short blind contour drawing of part of a terry cloth towel. I felt like a tiny ant wandering a fantastic landscape as I was doing this drawing! Very often your “drawing” will just look like a bunch of squiggles. If you read Franck’s lovely book, try not to be intimidated by his illustrations. His blind contour drawings do look like something, because he’s been doing it over and over for so long that he has trained his eye and hand to move together really well. But, if you allow yourself to get caught up in what your drawing looks like, your attention will be diverted from the thing you are trying to really see deeply, and you’ll lose the point of the whole exercise. Use your non-dominant hand to draw. That might lower your expectations enough that you can turn off any ego-involvement with what the outcome looks like. Use a brush-tip marker and hold it way back at the far end so you have very little control over the tip. Put your object on a table and put your paper on your lap underneath the table, so you absolutely can’t peek. By the way, while your blind contour drawings may not look much like the object you are drawing, they often have a fascinating organic shape or texture and make great Creative Seeds for later work. As a meditation practice, it’s hard to beat blind contour drawing, but in my journal, I’d like to have some of the benefits of mindfulness meditation, but also some artistic expression. Sometimes, I do want my drawings to look like something. But, I don’t want to let myself go so far with trying to make an accurate rendering that it turns into work! My solution is to draw what I call Wonky Wobblies. Wonky wobbly drawing of a neighborhood cat. I added the watercolor later. In Wonky Wobblies I do look at my drawing as well as the object, but I still try to keep reminding myself to spend more time looking at the object than the drawing. I hold my pen or pencil loosely, purposely letting the line be wobbly and the proportions be wonky. I often draw these with my non-dominant hand so the line will be even wobblier. I love the playful look of these wonky, wobbly drawings. I love the wonkiness so much that I sometimes worry that my non-dominant hand is getting too good! Some days I am amazed as how much they look like the object or scene. The lines may be wobbly and the proportions might be off, but there is something these drawings capture that a careful rendering misses. This drawing amazed me. I had been trying—unsuccessfully!—to draw this boat accurately. Finally, I gave up in disgust and decided to do a wonky wobbly drawing. I guess that’s when I really paid attention to what I was seeing! Other times, they don’t look like much of anything. But that’s okay. Then they just become Creative Seeds. I might go back in some other day and doodle over them or cover up part of the drawing and keep another part for an interesting pattern or shape. A wonky wobbly drawing of the same houseplant I had done a blind contour drawing of before. I drew this one with a water-soluble pen, and then used a wet brush to smear the lines to suggest shadows. It doesn’t “look like” the plant at all, but I like it! The point is, I’m released from any requirement to make them “look right”. In fact, I’m trying to make them wonky-looking, so I stop putting so much attention into “getting it right” and I keep more of my attention on what I am seeing and how I am feeling. If you find that you still get caught up in criticizing the appearance of your drawing, Directed Doodles may help. This activity combines the soothing repetition and pattern-making of doodling with the deep seeing of blind contour drawing. In this case, instead of trying to keep my eye following a contour and my pencil on the page, I just pick a little piece of the object or scene that appeals to me and draw that shape or contour. Then I repeat it as much as I want and I let it evolve into a different type of mark or shape if I want, just as in doodling. When I am tired of that shape or mark, I go back to the object or scene to see what else catches my eye. I find something else that interests me and doodle that shape for a while. These art supplies on my desk (plus some shapes from the yard in the background) were the basis for my directed doodle. I change size willy-nilly and pay no attention to the how the shapes were related in the original object, unless I want to. I might see a tiny little intricate shape and draw it large, and then fill it with a pattern made from another shape that is much larger in real life. I might repeat some shape many more times than it actually appears in the scene. Basically, I’m doodling, but using the object or scene as the source from my doodle-shapes and patterns. Sometimes, there is enough of the original object or scene in my drawing that it’s recognizable, but that’s not my goal. The same directed doodle a bit later. Notice how the “brush” shapes got repeated again much larger. I’m sure I’ll come back to this again. Next time, I might use entirely different things as inspiration for my doodle shapes. I like to do all of these techniques over previous Creative Seeds, especially random watercolor strokes. A directed doodle done over a random watercolor Creative Seed that had some of the colors and shapes from the scene I was using as the basis for my doodle. I’m sure I’ll work further on this one, too. I’ve used mostly black ink for the examples, to make them show up better in the photos, but I also like to use color when I do these in my journal. I hope these activities help you give yourself permission to draw badly in the service of seeing deeply! As always, I’d love to hear about your experiences. Did you really see something for the first time today? What was it? Leave a comment or share an image.